The visitor centre in the Phoenix Park has some of the most stunning trees to be found anywhere in the park. I think a lot of people visit this area of the park on a daily basis and simply don’t even think about looking up. There are some of the finest and probably oldest trees to be found right in front of you but most people visit this area to have a look at the visitor centre and maybe a picnic in the summer. Don’t get me wrong there is nothing wrong with that, in fact I think the visitor centre and cafe are two of my favourite things to do on a rainy day. If you ever find yourself in the visitor centre then I recommend you walk out past the beautiful little mini-maze and just stand in the middle of the grass by all the picnic benches, then slowly raise your head and take in some of the tallest and most beautiful trees to be found in this wide expanse of woodland. The gardens and general area around the visitor centre and superbly maintained, credit must be given to the staff for the job they do around here. There was something very striking about this tree and I have gone back to it on many occasions, I have never been happy with any of my photographs though. There are so many other trees close to it that it’s always been really hard to isolate it in a photo, I think it deserves a photo all to itself. I just happened to chance a visit a few weeks back with some infra-red equipment, it was one of those bitterly cold but sunny mornings and I thought it was worth trying out in infra-red. 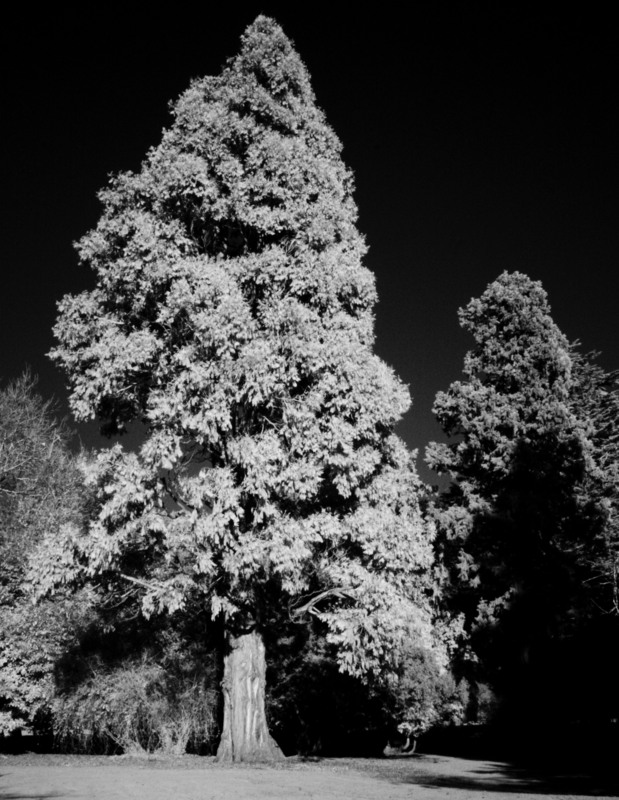 Finally, I got a shot that I was more than happy with, I think the infra-red really does it justice and seems to remove anything else from the shot altogether. Just because I finally got a shot of this tree that I am happy with doesn’t mean I won’t be visiting again, and again and again and again. Trees are so dependable, they are always in the same place you left them regardless of how long you leave them til your next visit. This particular tree should think about getting an equity card, its only a matter of time before the producers of the Hobbit movie come looking for its like. This entry was posted in Irish Landscapes, Phoenix Park and tagged Phoenix Park. Bookmark the permalink. ← A Small Duck Pond Saves My Day.